Bodhi Linux on 32GB USB Drive | Linux DVD Shop - UK Linux Shop supplying Linux on CD, DVD and USB with Free UK Delivery, 24Hr Dispatch. 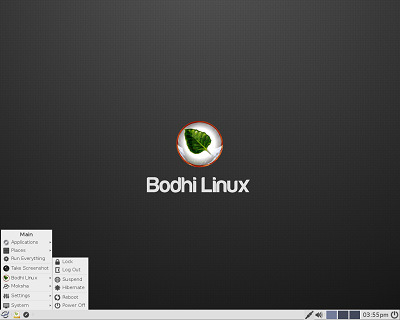 Bodhi Linux is an Ubuntu based distribution offering modularity, a high level of customisation, and choice of themes. It features the 'Moksha' Enlightenment 17 window manager as the default desktop user interface. This coupled with a minimal set of utilities such as a browser, text editor, and package management tools form the solid foundation of Bodhi Linux. It aims to provide a minimalistic distribution with exceptional speed and low system requirements, allowing for a beautiful, useable, and customizable desktop experience.